What's worse than being locked out of a bottle of beer or wine? Nothing, final answer. You'd rather be shrunk and shunted inside the bottle than standing there holding it like a clod. But there's a way. Ten to be exact. Want to breach any bottle without the “approved” tools? Read on for 10 hacks. Hold the bottle firmly with one hand and use your other hand to secure the edge of the buckle under the cap. Press your palm or thumb sharply on the other side of the buckle, so the buckle acts like a lever and pries up the top. Pro-tip: Put your belt back on before you drink too many beers. If you can pull this off, anyone you’re with will probably name their firstborn after you. Seriously, watch this oenophile from Mirabeau Wine show you how it’s done, and tell me you’re not already picking paint colors for the nursery. Take off your shoe. Leather soles are best; sneakers are too cushioned. You’ll also need a hard wall made of brick or stone. Remove the capsule (the sleeve around the neck) from wine, and set the base of the bottle in your shoe. With the shoe with one hand and the neck of the bottle in the other, aim and slam the bottom of the bottle against the wall with the shoe in between. After a few solid hits, the cork will begin to slip out. Or you’ll have broken glass everywhere. Good luck! Heads up, Frodo: that precious has more than one power. Use your ring to open a beer bottle, too. Soft metals like gold and silver will bend, so try this with platinum, steel or titanium. Put your hand over the bottle, and hook your ring on the side of the cap furthest from you. You want to catch the bottom of your ring on the cap. Be careful your skin doesn’t get pinched in between. Twist and pull up until the cap dislodges. Now collect all your badass points and drink up. For the smokers in the crowd—and pyromaniacs–you probably know that a lighter can save you from certain thirst. But how? All your attempts so far have failed. What’s the secret? First off, flat lighters rather than curved ones work best. Wrap one hand around the top of the bottle. Your index finger should rest one lighter’s-width down from the cap. Insert the bottom of the lighter between your index finger and the bottle cap. Press down on your lighter using your knuckle as support. You don’t need to pry. With the right lever action it will pop right off. Light a celebratory bonfire if you must. What’s that? You didn’t have a corkscrew and the shoe trick didn’t work? It was embarrassing? OK, we should have warned you: the shoe trick doesn’t work on synthetic corks. In that case, a key is the key. Remove the capsule from your bottle of wine. Take an ordinary house key and press it into the cork at a 45-degree angle. It helps if the key isn’t attached to a key-ring. Push it in as deep as you can. Use your thumbs to guide the cork around in a circle, lifting slightly at the same time. The cork will begin to rise. When it’s mostly out: use your hands to finish the job. This will prevent the cork from breaking apart. Do not murder your sauvignon blanc with a hammer. 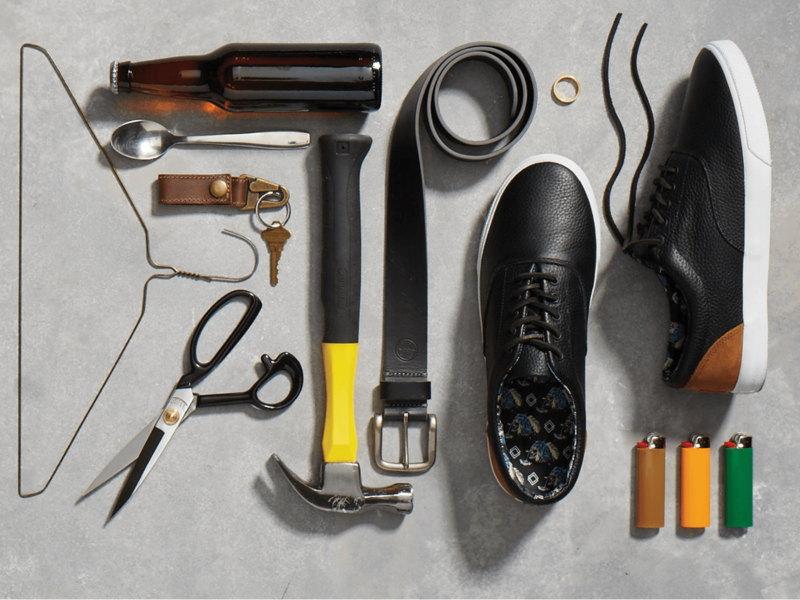 Instead use the tool to elegantly crack open an IPA at your next high-society shindig. Bonus points if someone is playing a harp and you’re wearing a toolbelt. Position the bottle cap between the claws of the hammer. Catch the bottom edge of the cap on the edge of the bottom-most claw. Give a slight upward thrust and the top should come off easily. Imagine the look on the harpist’s face. Drinking a merlot alone in your closet? Totally understandable. Forgot to bring a corkscrew? Less understandable—but you’re in luck. A wire coat hanger is easily jury-rigged to become a makeshift corkscrew. Bend the tip of the hanger back about 30 degrees, so it’s a bit longer. Slide the wire in between the cork and the bottle, about halfway, and then twist the wire into the bottom of the cork. Using a towel to hold the wire (or pliers if you have them), pull the wire up firmly. The cork will pop out. Then again, if you’re stuck in a closet with a bottle of wine, a pair of pliers and a towel, spare us the details. With a pair of strong kitchen scissors or garden shears, you can snip your way to satisfaction. You have to promise you won’t run with them. And return them back to the drawer. Yeah right you will. Open the scissors and set the blade against one of the ridges in the bottle cap at a slight angle. Cut through one of the small ridges at an angle. That will loosen it ever so slightly. Snip your way around the bottle cap until it can be removed. Pat yourself on the back for getting there injury free. Still in the kitchen but can’t find the scissors? (Told you.) A spoon will also do. Besides, how often do you get to open a bottle of beer with an ordinary spoon? Here’s hoping not often. Put your hand around the neck of the bottle. Secure the small tip of the spoon under the edge of the cap. The bottom of the spoon bowl should be slightly resting on your other hand. Like the lighter method above, use a lever action to bring the back of the spoon down and pop open the bottle. Do not use spoon to drink beer. That seems inefficient. And the most meta solution of them all: open that beer with another beer. If it sounds simple it’s because it is. You need two unopened beer bottles and just the slightest bit of finesse. Flip the left bottle upside-down, and secure the lip of its lid against the lip of the right. They should be side-by-side. Grip both bottles tightly and twist the left bottle like you’re turning a door knob counter-clockwise. Fun fact: You can use the bottle cap from the opened bottle to open the next one. But you’ll have to figure that one out yourself. Have other ways to open a bottle without a bottle opener? Tell us in the comments below.